various national and international funding agencies. The department has also set up several international tie ups with or without funding from govt. agencies. 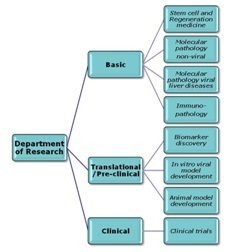 A multidisciplinary approach is being used to address various pressing needs in the area of liver disease progression and these include: molecular immunology, identification of microRNAs by Next Generation sequencing, role of gut metagenome in gut-liver axis, proteomic and meatbolomic approaches to identify biomarkers in acute on chronic liver failure, animal models of cirrhosis and acute liver failures, role of tissue microenvironment in liver regeneration and mechanistic roles of liver degeneration such as apoptosis and cellular senescence. Mission of the department is to “understand the molecular basis of liver disease and translating findings into clinical applications for better diagnosis, effective treatment and prevention strategies “. The three pillars of the department are basic research, discovery research and translational science. Our vision is to develop into a state of the art research centre of excellence in Liver Biology and foster strong collaboration between laboratory scientists, clinicians, and industry. In this regard the department fosters multidisciplinary scientific research activities focusing mainly on liver diseases using animal models, in vitro systems and clinical specimens . The research in the department is funded dominantly by extramural grants from various national and international funding agencies. Metabolome and Metagenomics laboratory in partnership INSERM, France . DST funded core Laboratory for Non-Transplant Therapeutic Strategies For Advanced Liver Disease. Indo-US Laboratory for Human Immunology Project Consortium (HIPC) under the ageis of DBT-NIH alliance. ILBS-INRA (France) joint laboratory for studies liver diseases and gut microbiota. Presented an oral presentation at the meeting of the American Association for Study of the Liver Diseases (AASLD) 2013 held in Washington DC, USA on 4th November, 2013. Presented an oral paper in Best of AASLD meeting held on 7th and 8th of December 2013 in Mumbai.